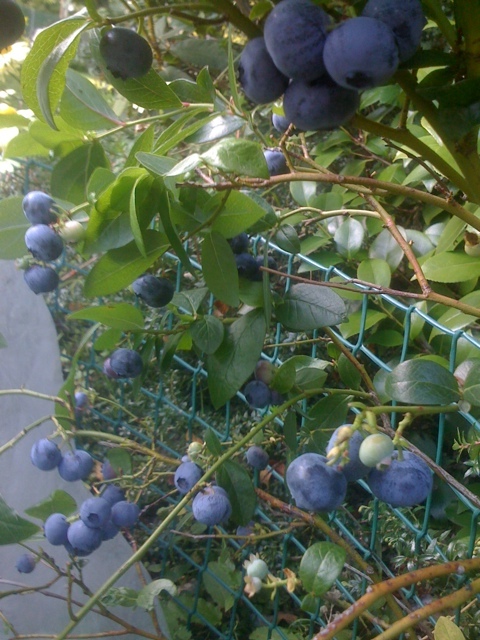 These are the best blueberries I have ever grown. The secret is to keep the perishing birds off without netting the birds and perishing them. 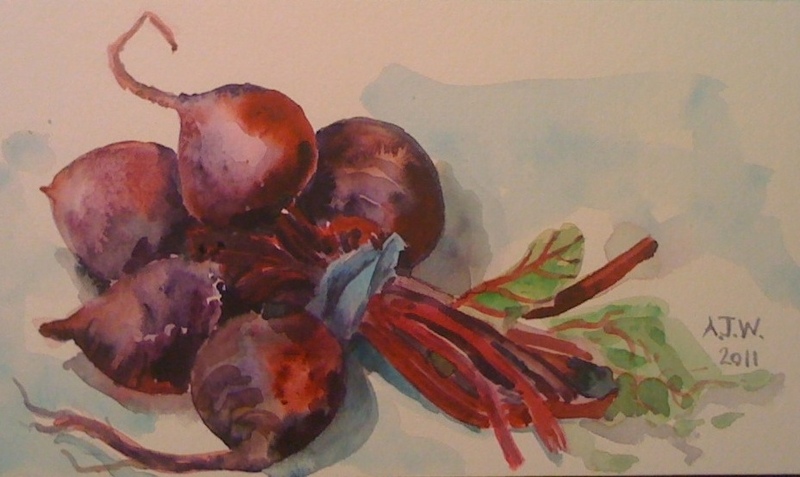 There is very little time in the day when there are so many plants to water and crops to pick, I do not try and grow beetroot as I am the only person besides lovely aunt who really likes it, so these are bought and no less pretty for it. The allotment has peas and beans in astonishing variety at the moment, diy dad has dug out his early carrots and the maincrop carrots are coming up. I have a forest of flat leaved parsley in the salad bed and the first tomatoes are ripening. The first autumn cyclamen is out as well….excuse me but the proms are only just begun, cyclamen??? Just so you are not worried by the numbering; I made a mistake on the numbering of paintings while I was away , therefore the picture of the monastery in Croatia has been renumbered as# 117, it was previously #108. Rain, it just isn’t stopping, it is slowing for a while and then starting up again. There seems to be a chance that there will be some almost dry weather over the weekend…please let that happen as I want to have some time to enjoy the garden again. At the moment I am going out and getting wet and muddy even to pick a handful of tomatoes. I picked six today and we ate the four from yesterday…we are self sufficient in tomatoes! There are some late flowering treats, the cyclamen are getting started, the relocated ginger lily or Hedychium is in bud, the Canna lily is shredded by the wind and rain, and some late sown morning glory are growing like they mean it and the first beautiful purple trumpet opened today. It is scrambling up with a very vigorous Cobaea Scadens which hasn’t flowered at all yet. Having looked it up to see how to spell it, I see that it is in fact perennial but only half hardy….will it like being cut down and put on a window sill overwinter? 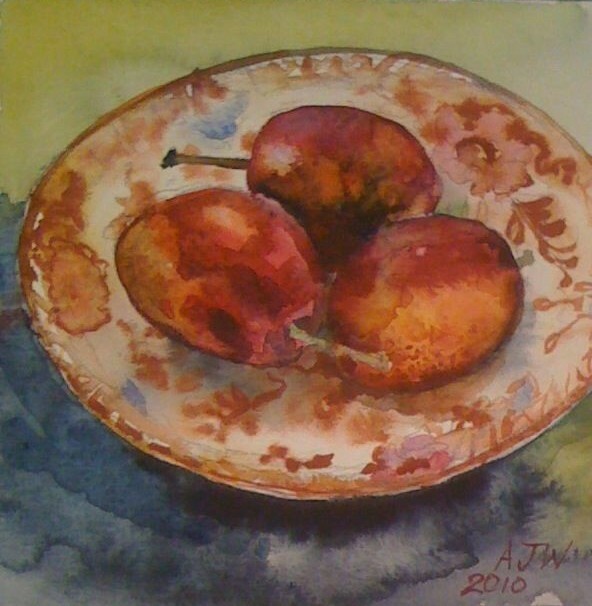 Today’s painting is of the last three Victoria plums which came from A & R’s garden at the weekend. They do actually look Victorian in their colouring all those heady purple and red dyes that they discovered and loved to use). I decided to put them on a little Staffordshire saucer.